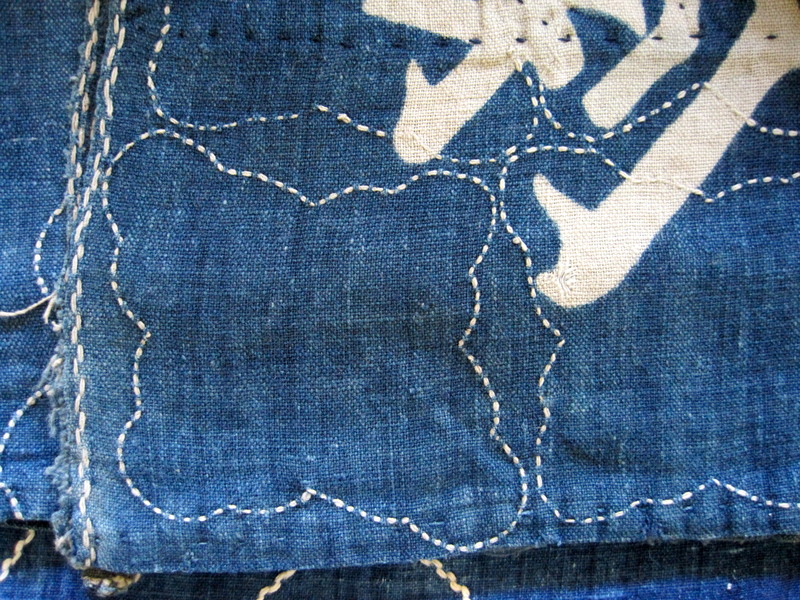 This Meiji era furoshiki or “carrying cloth” was probably once the smallest of a set of three furoshiki that were part of a brides trousseau. 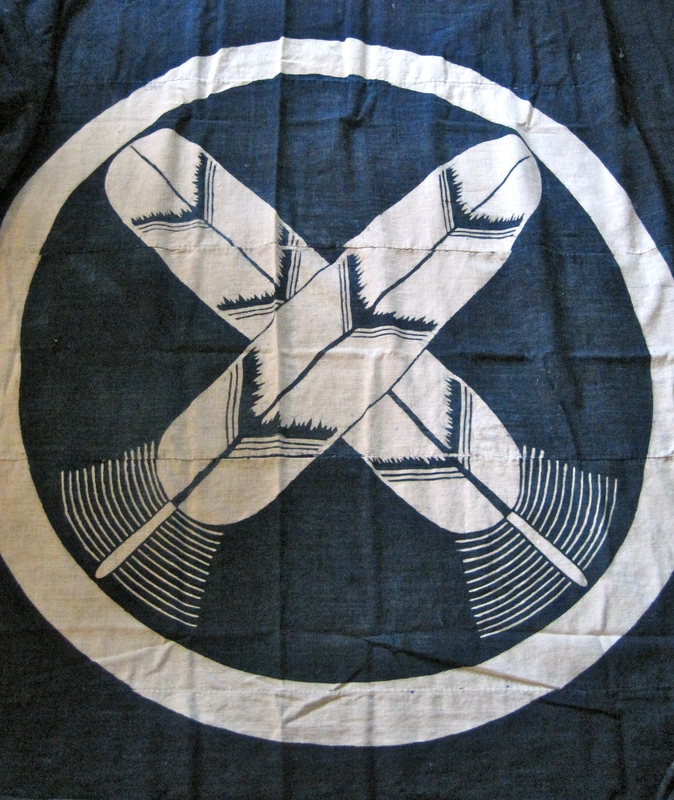 The central kamon or “crest” and the kanji on the side have been dyed using a technique known as tsutsugaki. 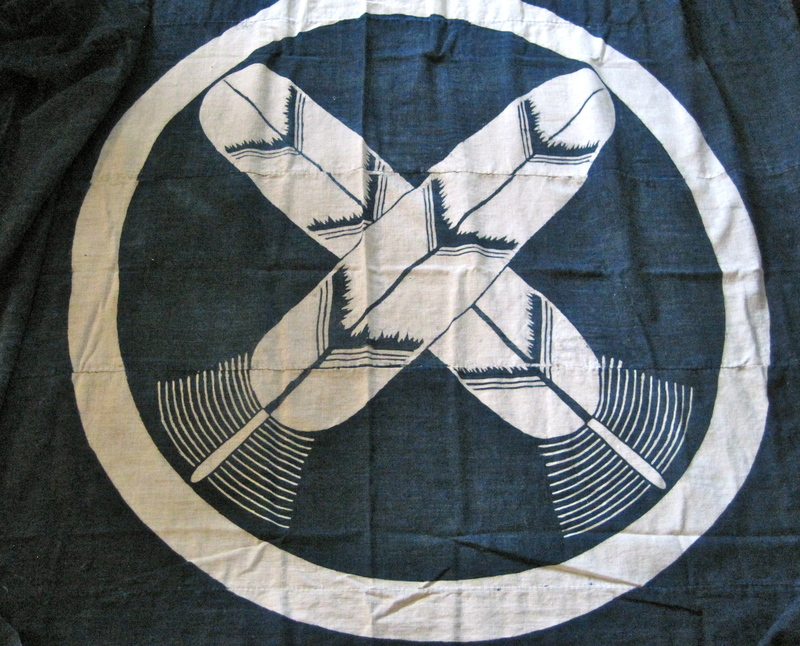 I love the simple design and the naive way the kamon and kanji are rendered. 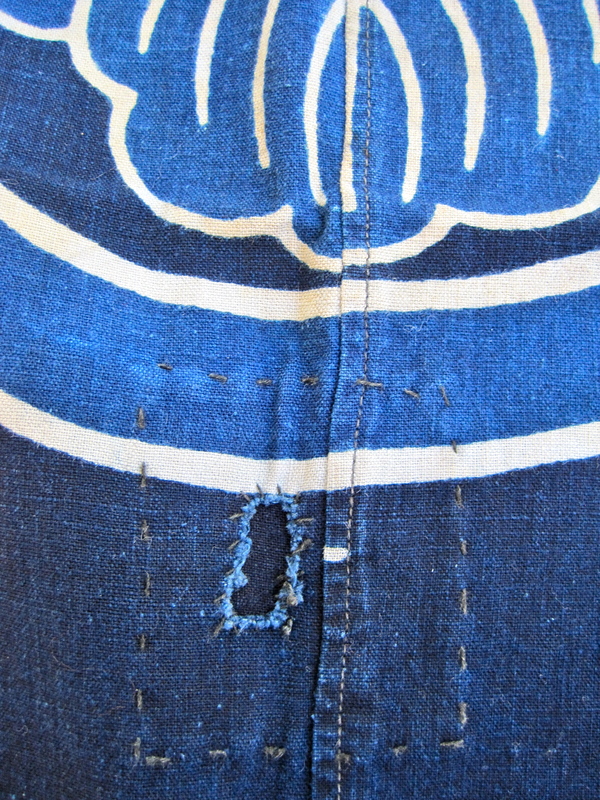 What makes this piece so nice are the beautiful patches and stitches that adorn the back and peek through to the front. 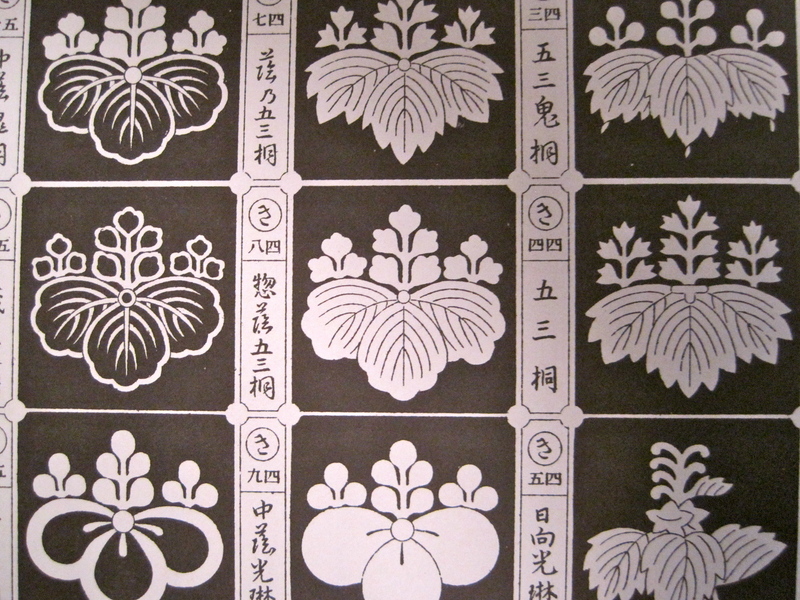 I found this kamon in a Japanese book of family crests compiled in 1913. 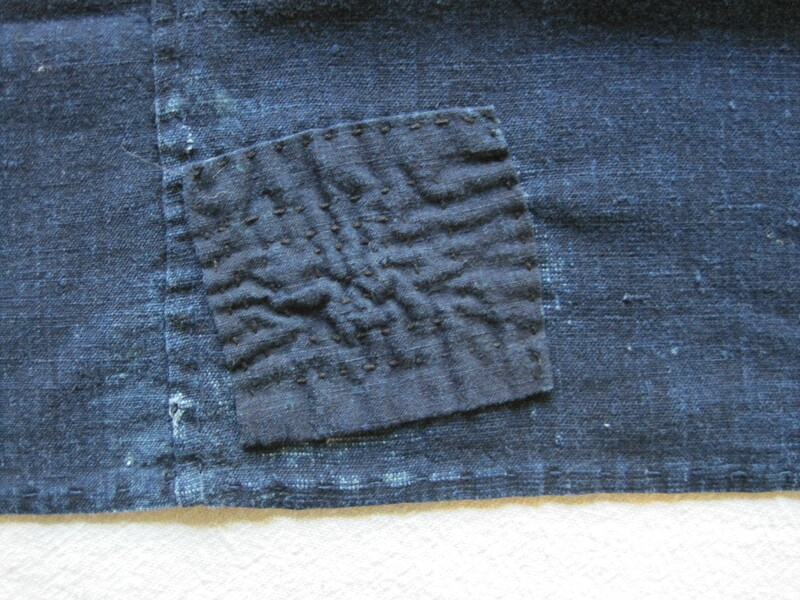 At first glance these patches seem ordinary. 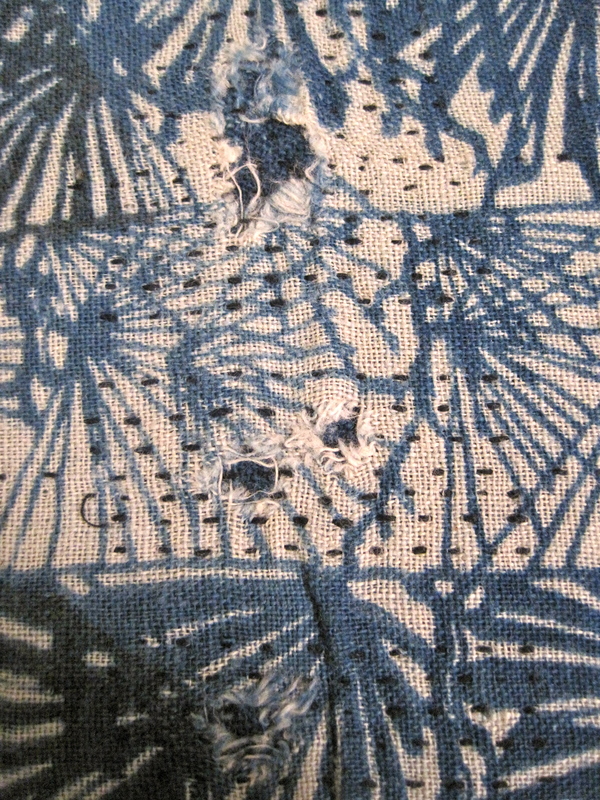 The first is a patch of small sashiko stitches and the second a normal enough blue patch with haphazard stitching holding the two pieces of fabric together. 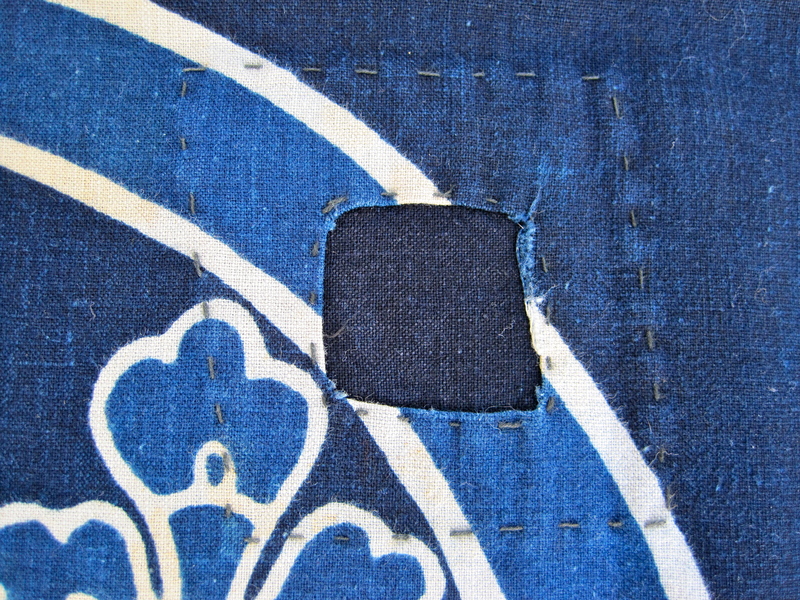 When you turn the piece over it reveals two beautiful patches made from beautiful Edo period katazome. 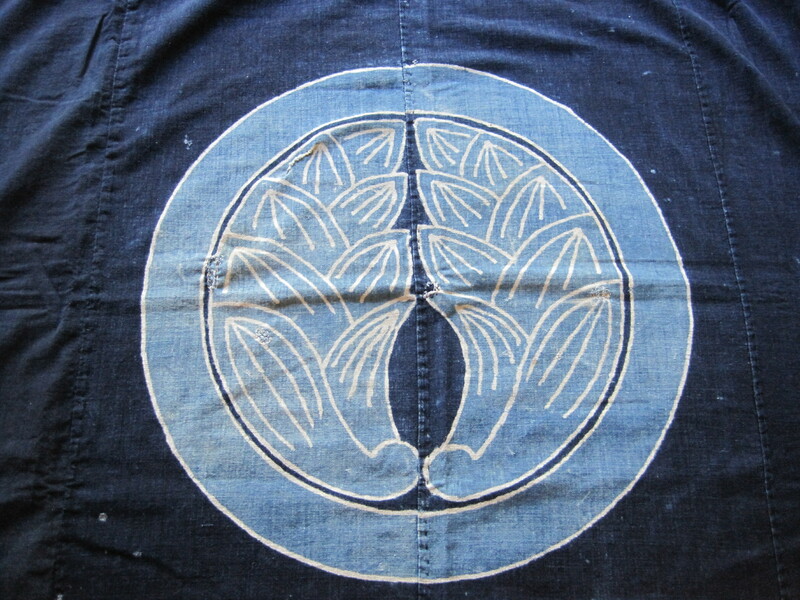 This patch is decorated with an amazing fern design often seen in late Edo and early Meiji tsutsugaki and katazome fabrics. 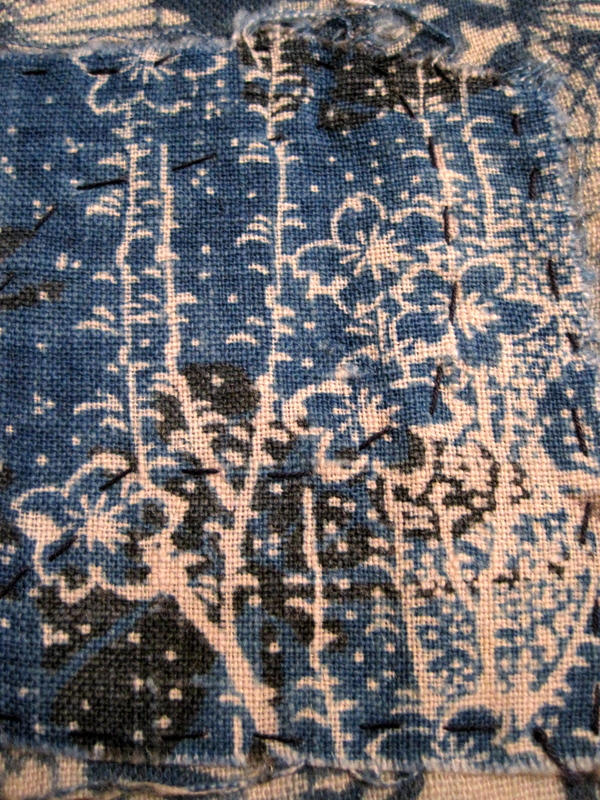 The next patch has a beautiful double design of black leaves and branches on an indigo ground, as well as, resist dyed cherry or plum trees with stylized blossoms. 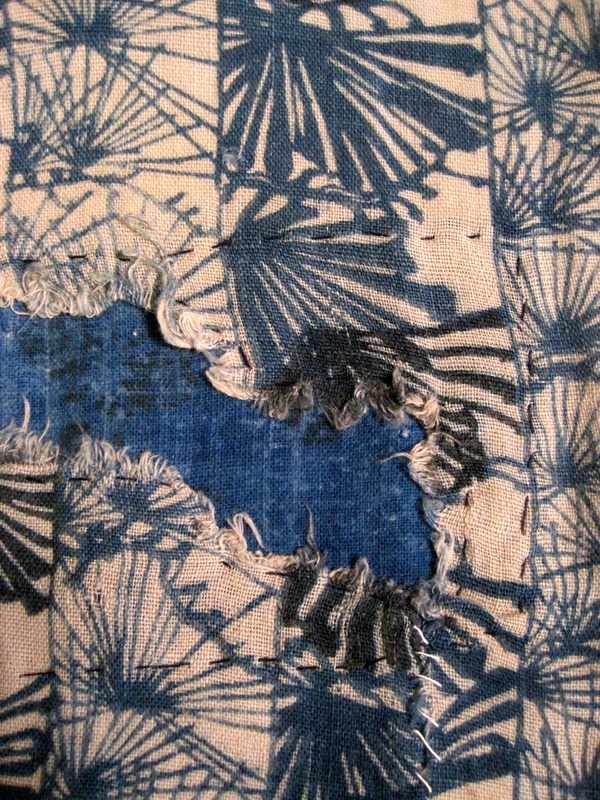 I can’t even begin to understand the process of dying something like this. 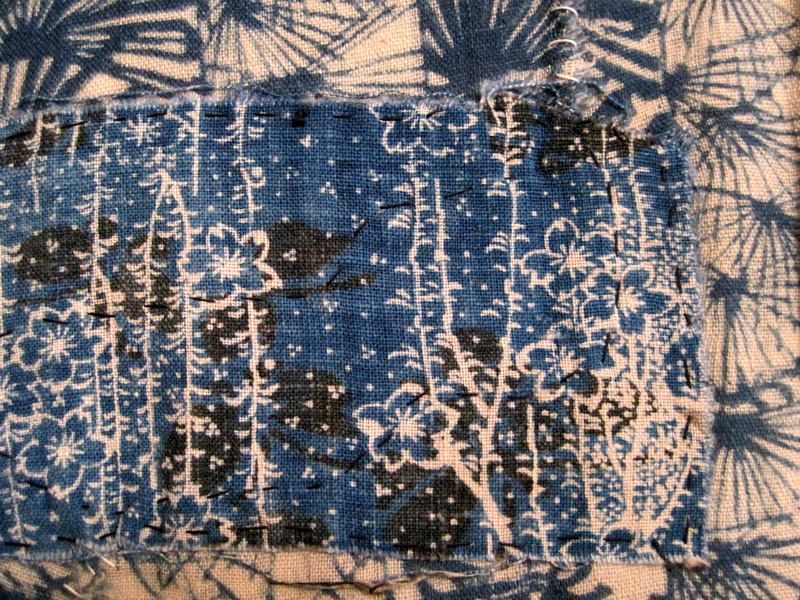 I think these patches elevate this beautiful Edo period katazome, and I am in complete reverence of the masterful hands that created these fabrics so many years ago. 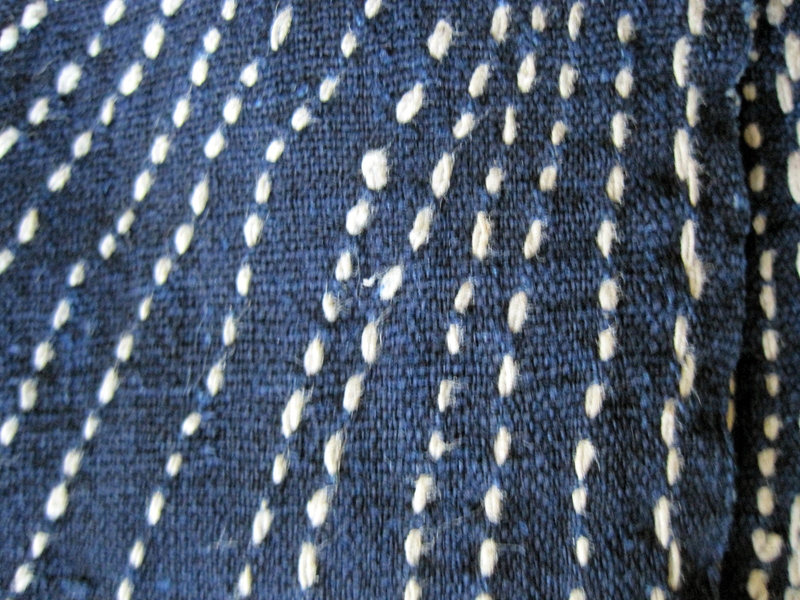 Sashiko is a form of traditional Japanese embroidery originally used to reinforce garments and as a means of repair. 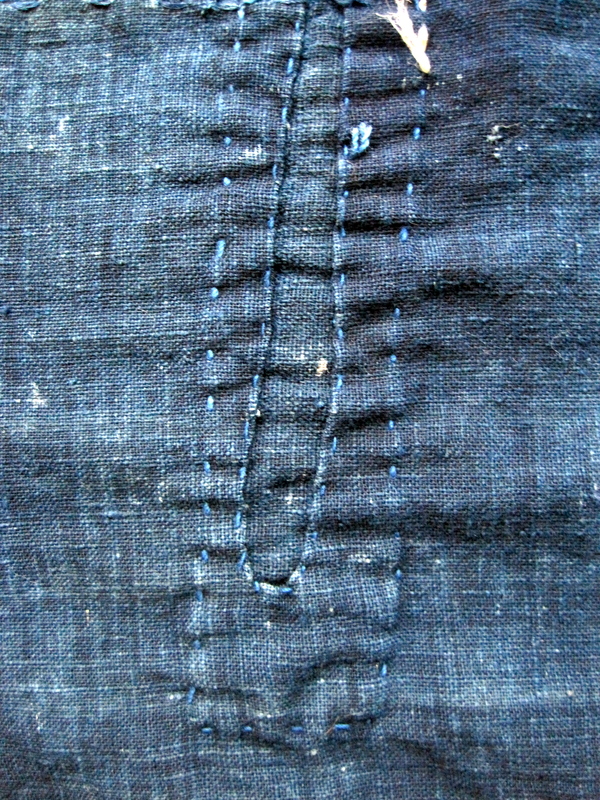 In the northern regions of Japan garments were made stronger and warmer by layering cloth and stitching the layers together with long running stitches. 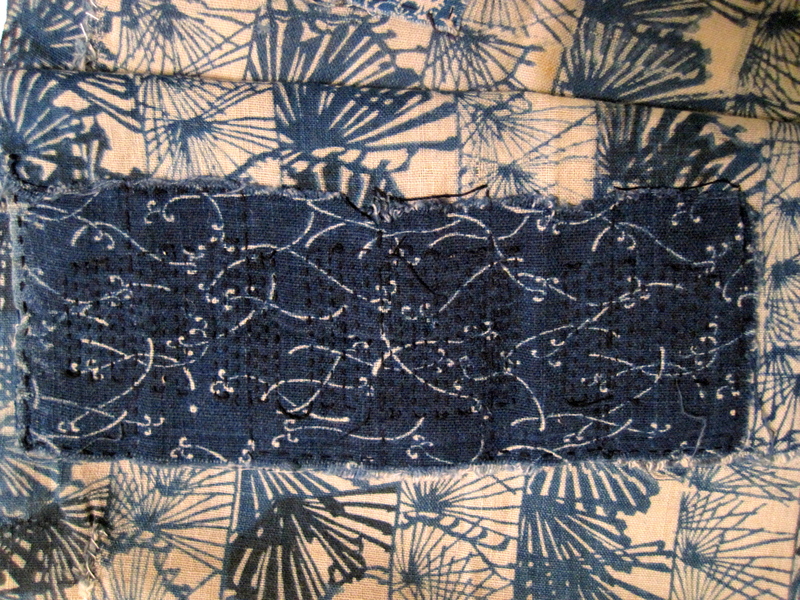 This embroidery served a utilitarian purpose but also became a way to add decorative patterns and interest to garments and carrying cloths. 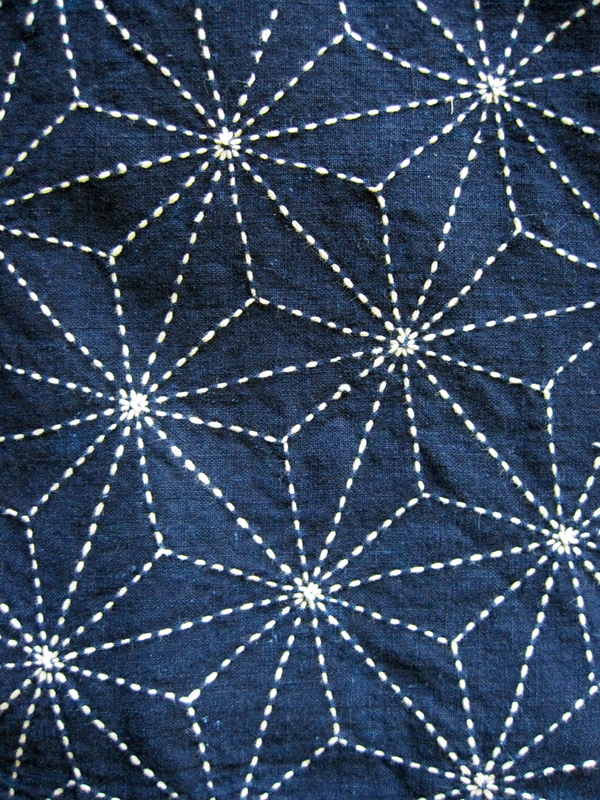 Three of these sashiko furoshiki were created from hand spun and handwoven cotton which has been dyed with natural indigo. 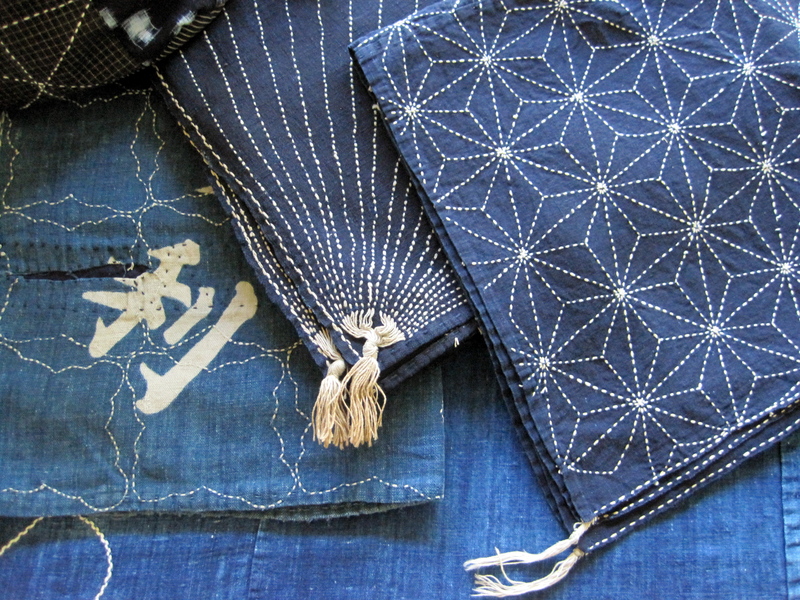 the forth furoshiki with the star pattern is made from hand dyed commercially produced cotton. 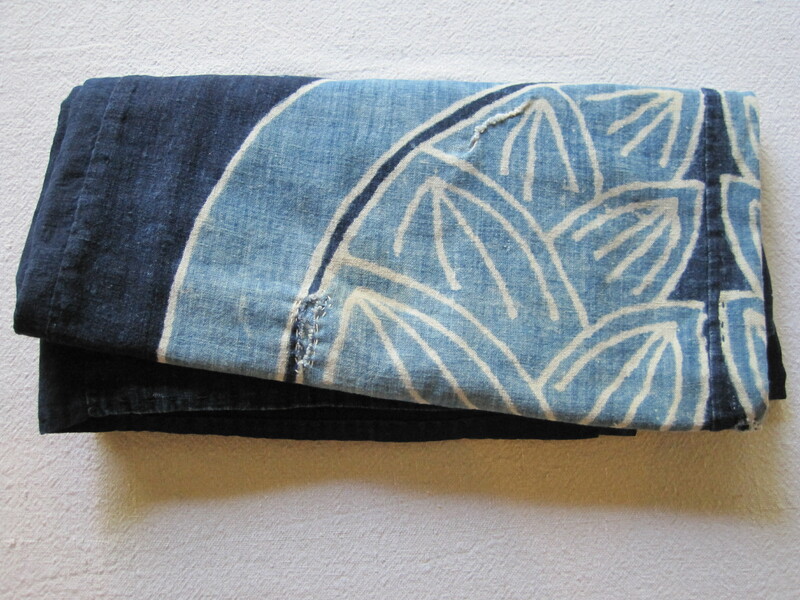 This furoshiki or “carrying cloth” was made from rustic hand spun cotton. 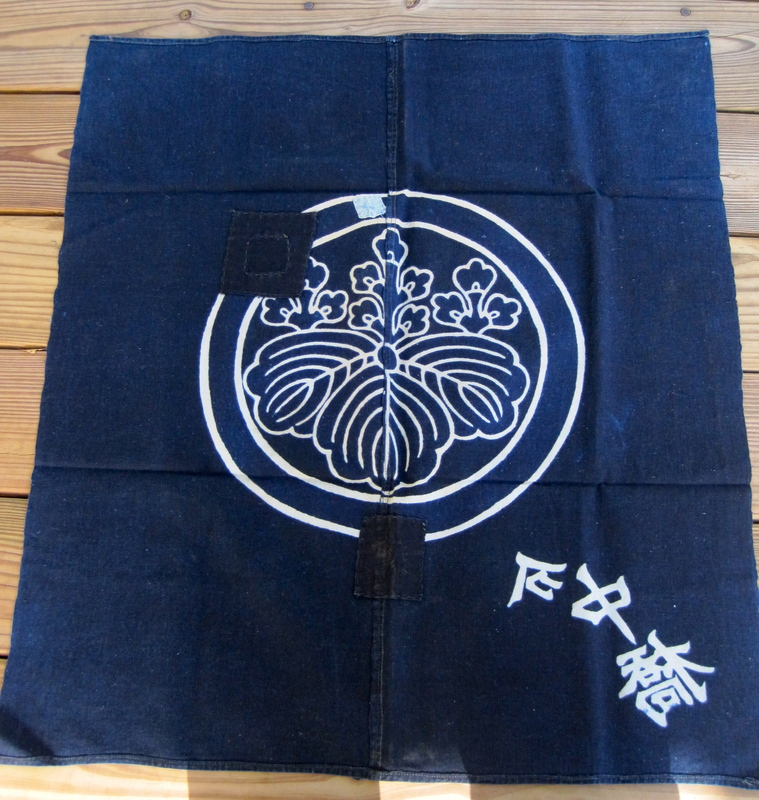 The design of a ginger flower kamon against a deep indigo background was achieved through the process of tsutsugaki. 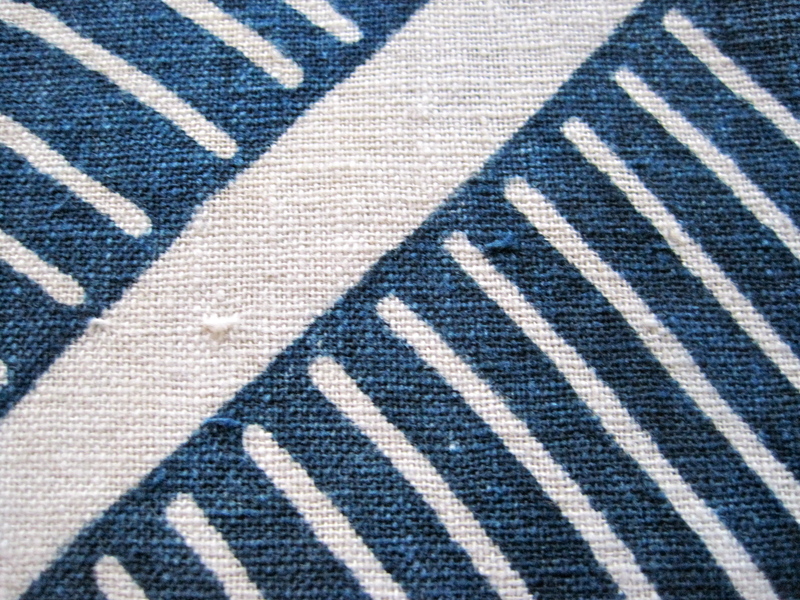 Rice paste was pushed through a small metal tip affixed to a paper bag. 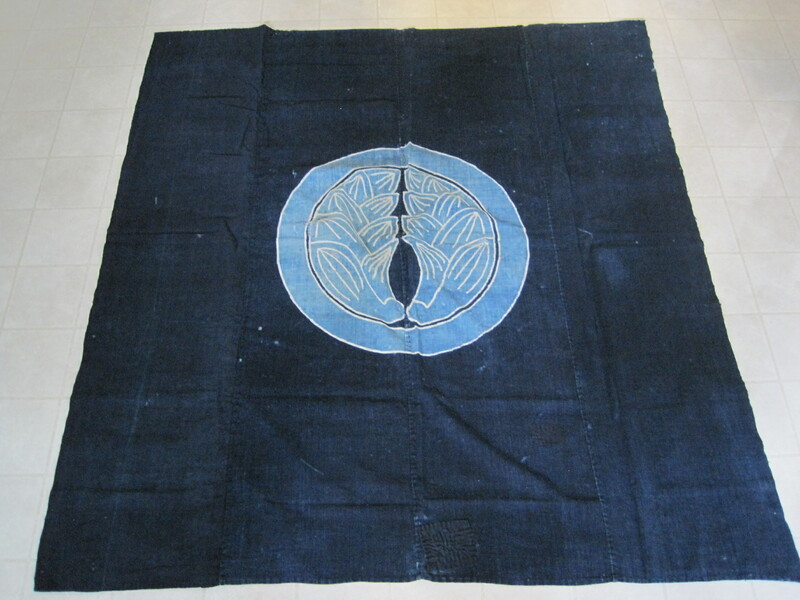 After the design had been executed the fabric was dyed and then washed to reveal the outline of the ginger flower kamon. 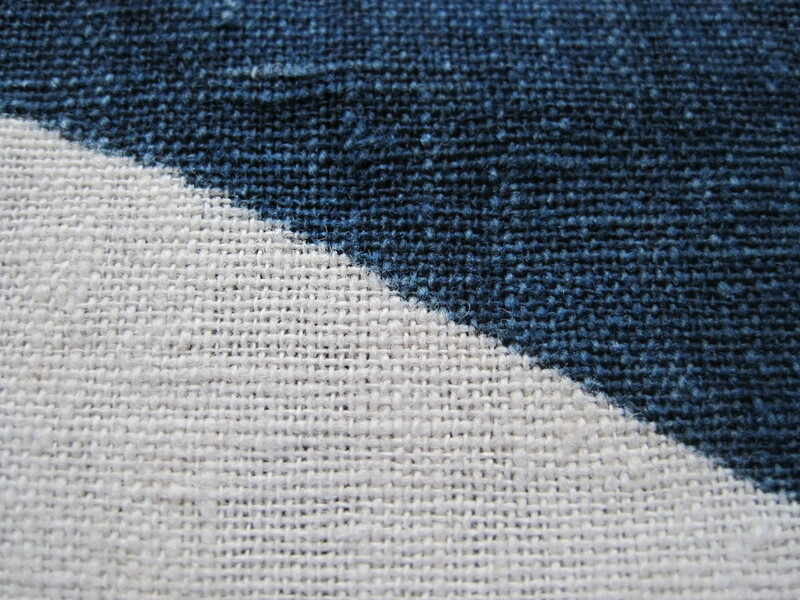 rice paste would have then been applied again to the areas that are now white before drying for a second time. 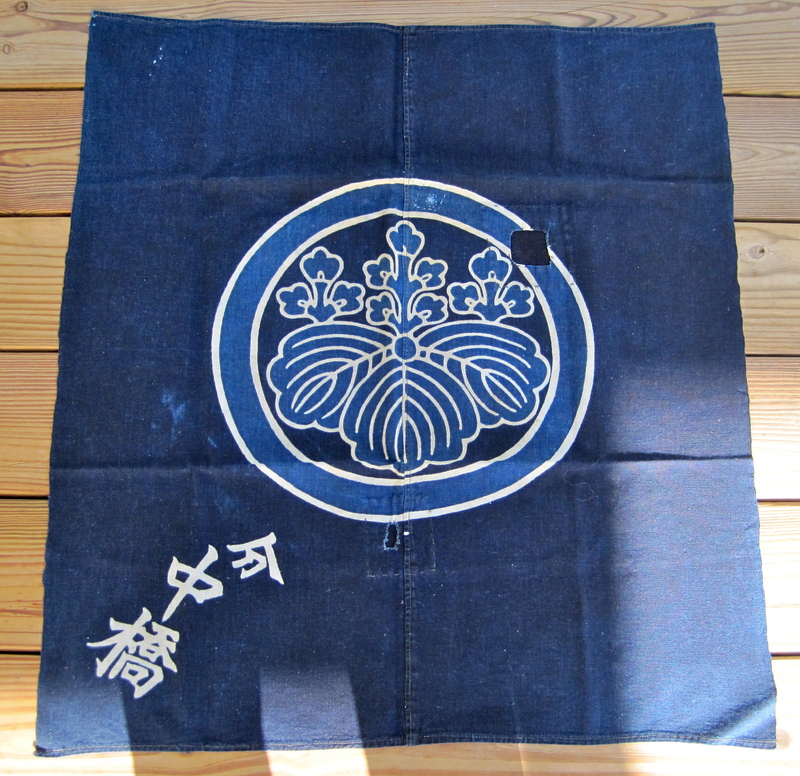 The deep indigo color of the background could have taken, as many as, 20 dips into the indigo dye vat to achieve, while the light blue of the kamon more than likely only took a few. 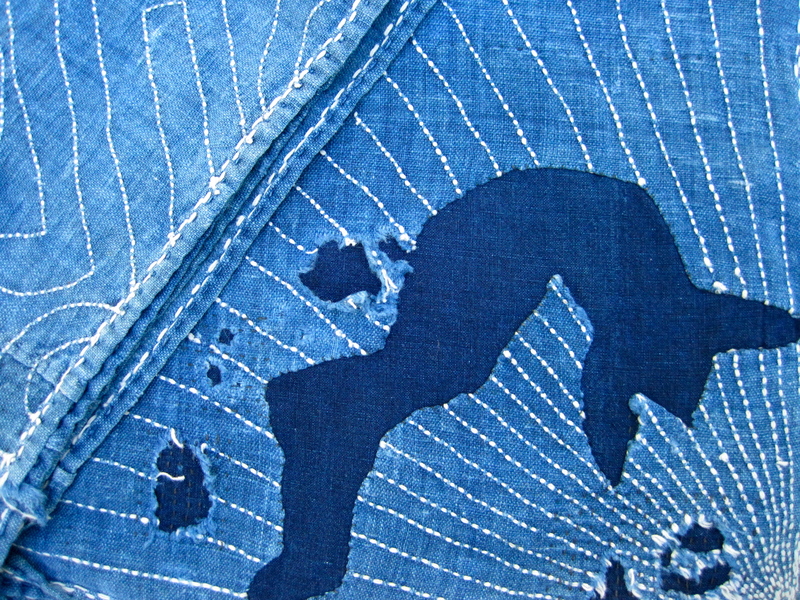 This attests to the great skill of old Japans rural dyers. 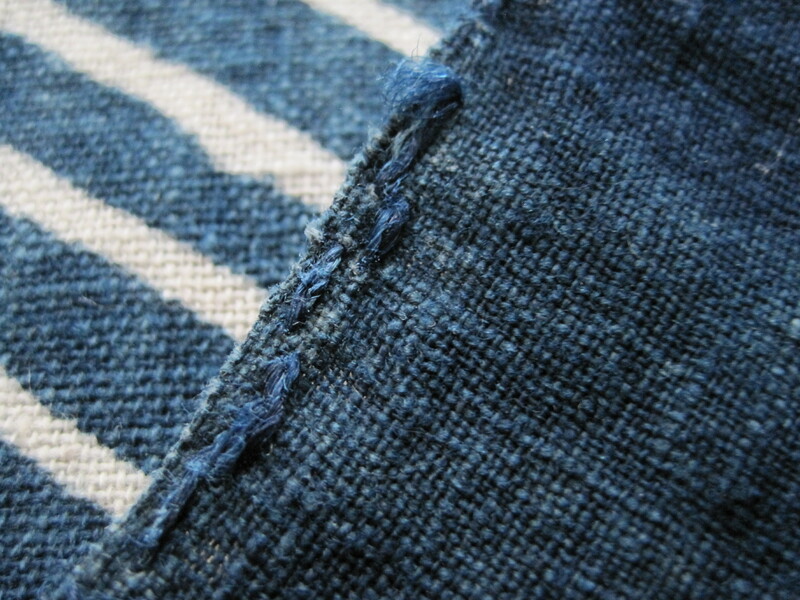 This furoshiki also has some beautiful repairs. 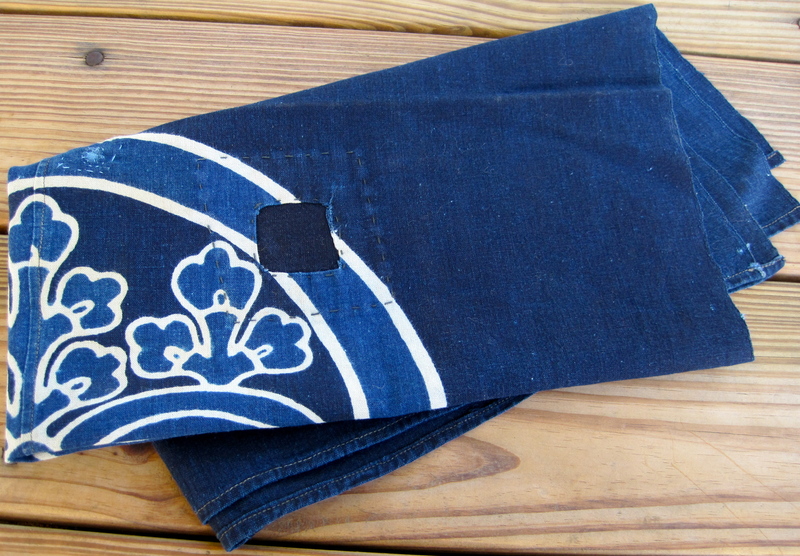 there are several mended holes within the kamon itself, but one of the most beautiful is located at the center bottom of the furoshiki. 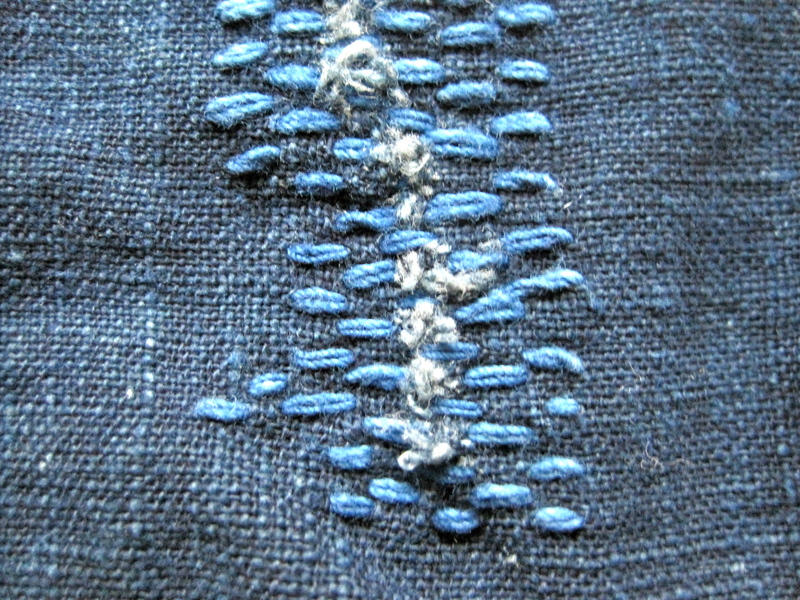 This indigo patch has been applied with indigo dyed thread. 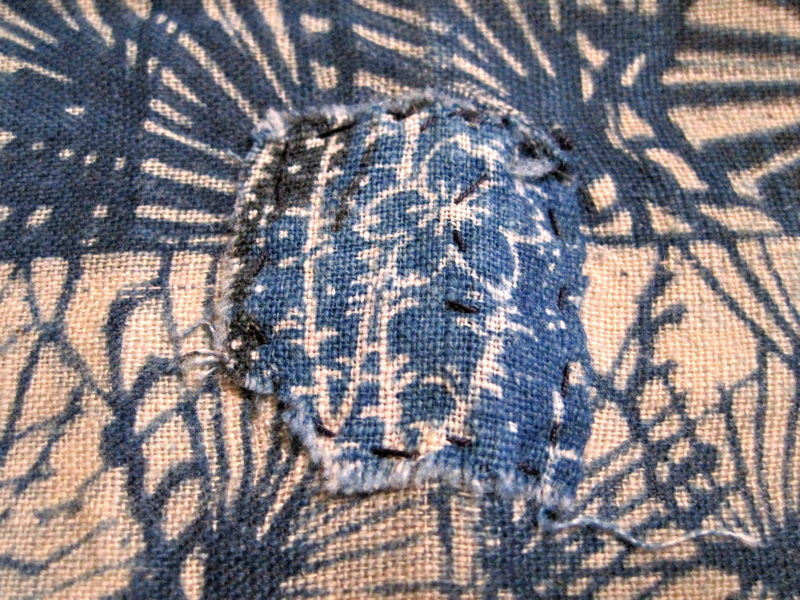 I love the unintended texture of this patch.